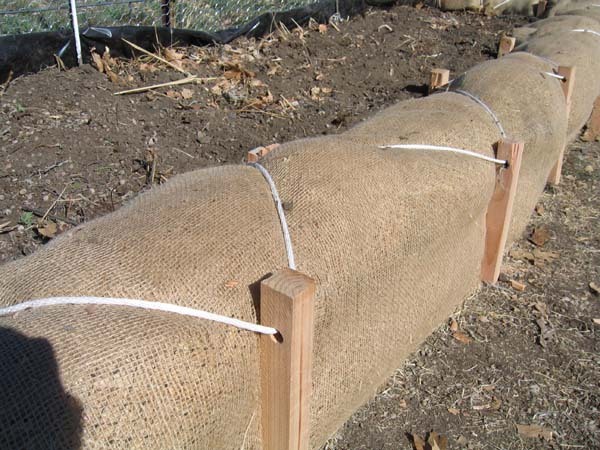 The wattles are made from straw or other similar materials and can be purchased at landscape supply warehouses. You may have seen them used on construction sites to control runoff. They come in different sizes, from 6” to as much as 20”diameter. I found my 12” diameter excelsior wattles at Western Landscape & Geotextile Supply in Denver for $1.42/ft. Excelsior is a type wood shaving that is used in packing, upholstery, and taxidermy among other things. I chose it because it’s stiffer than straw and will last longer. I used an existing metal fence covered with chicken wire to provide the backing for my bed. The wire fence will also support climbing vegetables. I lined the fence side and the inside of the wattles with plastic. In Colorado, conserving moisture is important and I wanted the wattles to last longer by not exposing the inside to the damp soil. Once the wattles were stacked, 2 x 2 wooden stakes were pounded into the ground on either side. We predrilled the stakes to hold the rope, but I would suggest either drilling them after they are in place or drilling them at least 4” from the top because the drilled holes made the stakes prone to splitting when pounding them into the ground. The stakes we used were 24” long and I would use shorter stakes next time because they don’t need to be as tall as mine are. The total cost added up to about $100 for my 16’ long, 3’ deep, and 18” tall bed. The sides are firm and comfortable to sit on. I expect them to last two to three years. I like the flexibility of the wattles and if I find my commitment to the garden wanes, I won’t have the problem of what to do will hundreds of dollars of wood sided beds - the wattles will go directly to the compost pile for recycling. If I like my garden I can see myself adding more beds and replacing the low cost wattles as needed.